“The Tale of Princess Kaguya” opens Friday, Oct. 17, for a one-week engagement at ArcLight Hollywood, 6360 W. Sunset Blvd., Los Angeles. The dubbed version will be shown on Friday through Sunday, Oct. 17-19, at 11:30 a.m., 2:10 p.m. and 5:15 p.m.; Monday through Thursday, Oct. 20-23, at 10:50 a.m., 2:25 p.m. and 5:15 p.m., with an 11 p.m. showing on Thursday. The subtitled version will be shown Oct. 17-22 at 7:25 p.m. and 10:25 p.m., and Oct. 23 at 7:50 p.m.
Running time is 137 minutes, and the film is rated PG. For more information, call (323) 464-1478 or visit www.arclightcinemas.com. 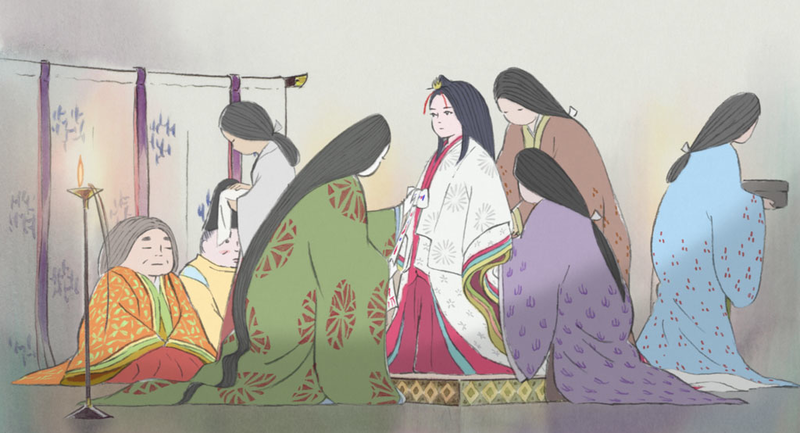 The English version of “The Tale of The Princess Kaguya” features the voices of Chloë Grace Moretz, James Caan, Mary Steenburgen, Darren Criss, Lucy Liu, George Segal, James Marsden, Beau Bridges, Oliver Platt, John Cho, and Dean Cain. The original Japanese voice cast includes Aki Asakura, Isao Hashizume, Takeo Chii and Yukiji Asaoka. The film made its international premiere earlier this year at the Cannes Film Festival and made its North American premiere at the Toronto International Film Festival in the Masters section. Also, the film recently won the Audience Award at 2014 Fantastic Fest. Legendary Studio Ghibli co-founder Isao Takahata revisits Japan’s most famous folktale in this gorgeous, hand-drawn masterwork, decades in the making. Found inside a shining stalk of bamboo by an old bamboo cutter and his wife, a tiny girl grows rapidly into an exquisite young lady. The mysterious young princess enthralls all who encounter her – but ultimately she must confront her fate, the punishment for her crime. From the studio that brought you “Spirited Away,” “My Neighbor Totoro,” and “The Wind Rises” comes a powerful and sweeping epic that redefines the limits of animated storytelling and marks a triumphant highpoint within an extraordinary career in filmmaking for director Takahata. “The Tale of the Princess Kaguya” is adapted from the 10th-century folktale “The Tale of the Bamboo Cutter,” widely known throughout Japan. It is the oldest extant Japanese narrative and an early example of proto-science fiction. The story details the life of a mysterious girl called Kaguya-hime, who was discovered as a baby inside the stalk of a glowing bamboo plant and is raised by a poor bamboo cutter and his wife. She is said to be from the Kingdom of the Moon and has been sent to Earth to serve punishment for some unspoken crime. Kaguya-hime grows rapidly from a small baby to a young woman of extraordinary beauty, and attracts the attention of five noble suitors and eventually the Emperor himself. She spurns their advances and sets them each an impossible task, promising to bestow her hand in marriage to the one who can fulfill his quest. Following this, Kaguya-hime retreats into a melancholy state, her eyes filling with tears every time she gazes on the full moon. Her adoptive parents worry greatly and question her, and she finally reveals that she is not of this world and must return to her people on the moon. When the celestial entourage comes to retrieve her, a robe of forgetfulness is placed on her shoulders and all of her sadness and compassion for the people of the Earth are forgotten. In Takahata’s hands, the folktale is transformed into a vibrant and powerful rumination on life’s paths and eventual end. 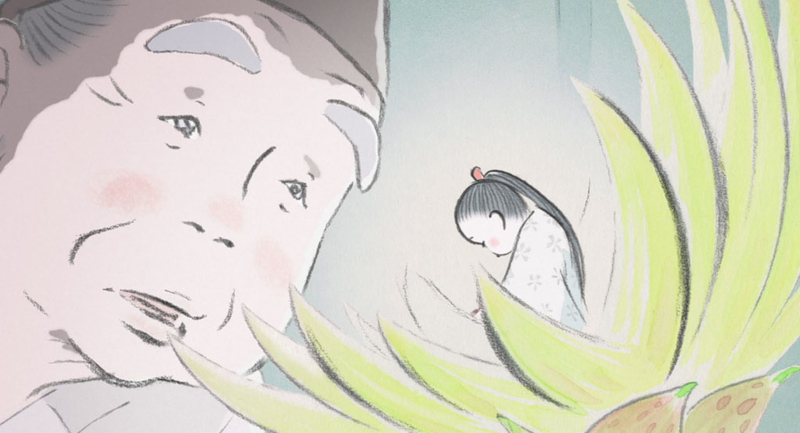 With her short time on Earth, Princess Kaguya experiences the joy, love, pain and bounty of our world with an all-embracing fullness that makes her parting from it all the more unbearable. The result is an artistic masterpiece, encapsulating all the wisdom and compassion of the filmmaker’s 78 years. For more information on the film, visit “The Tale of the Princess Kaguya” on Facebook. Studio Ghibli, founded in 1985 by animation directors Takahata and Hayao Miyazaki, is one of the most successful and well-respected animation studios in the world. Cultivating a creative force of talented directors, animators, and storytellers under the revered brilliance of Miyazaki and Takahata, Studio Ghibli’s films have been praised for their originality, dazzling animation, and epic storytelling. The films have become a beloved part of Japanese popular culture, and have garnered worldwide acclaim from audiences and critics alike. Born in 1935 in Mie Prefecture, Takahata graduated from the University of Tokyo with a degree in French literature. At Studio Ghibli, he has directed five animated feature films: “Grave of the Fireflies” (1988), named one of the greatest films of all time by film critic Roger Ebert; “Only Yesterday” (1991); “Pom Poko” (1994); “My Neighbors the Yamadas” (1999); and “The Tale of the Princess Kaguya,” released in November 2013 in Japan. He also directed the live-action documentary “The Story of Yanagawa Waterways” (1987). Takahata served as producer for Miyazaki’s “Nausicaä of the Valley of the Wind” (1984) and “Castle in the Sky” (1986). In 1998, Takahata received Japan’s Medal of Honor, Purple Ribbon. GKIDS is the distributor of award-winning filmed entertainment specializing in feature animation for both adult and family audiences. The company has scored four Best Animated Feature Oscar nominations – the most for an independent distributor – with “The Secret of Kells” in 2010, “A Cat in Paris” and “Chico & Rita” in 2012, and “Ernest & Celestine” in 2014. Upcoming 2014 releases include “A Letter to Momo” from Tokyo-based animation powerhouse Production I.G, and the highly anticipated “Song of the Sea” from Tomm Moore, director of “The Secret of Kells.” GKIDS also handles North American theatrical distribution for the Studio Ghibli library of films, one of the world’s most coveted animation collections with titles such as “Spirited Away,” “My Neighbor Totoro,” “Princess Mononoke” and others. GKIDS is the longtime producer of the New York International Children’s Film Festival, an Oscar-qualifying event and North America’s largest festival of film for children and teens. NYICFF jury members include Uma Thurman, Susan Sarandon, Geena Davis, Gus van Sant, Henry Selick and James Schamus.